Inter Aide is a French organization working in Malawi in the areas of water sanitation and hygiene, agriculture, health and school support. 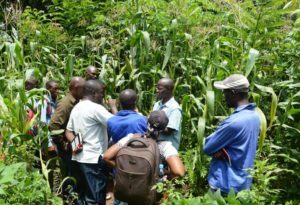 This week, they brought a group of extension workers and office staff to Never Ending Food to see how Permaculture ideas might be able to complement and enhance the work they are doing in the field. Many of the areas that they are working in are already closely related to Permaculture principles. 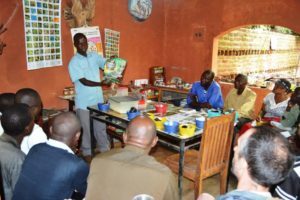 For example, the extension workers have been involved with the promotion of local seeds, community-based seed banks, agroforestry, and crop diversification. During their visit, they were able to see how these ideas fit into the bigger picture of Permaculture Design. This ‘design’ aspect is something which is often missing from many agricultural methodologies being implemented throughout Malawi. A design is a vision for the future, and if we are aiming to create permanent agriculture (permaculture), then we need to design systems which are based upon the implementation of seasonal, perennial, diversified, and locally-appropriate resources. Currently, most farmers harvest everything out of their fields in April and then there is very little access to food until the next April. In a country with a tropical 12-month growing season, it doesn’t make much sense to try to get a year’s worth of food in one month. The Inter Aide workers were able to see how Never Ending Food has been able to establish over 200 foods with access to Malawi’s 6 food-groups on a daily basis.